Security changes ? enable Windows Forms assemblies to execute in a semi-trusted manner from the Internet, and enable Code Access Security in ASP.NET applications. .NET Compact Framework ? a version of the .NET Framework for small devices. Full 64-bit support for both the x64 and the IA-64 hardware platforms. SQL Server integration ? .NET 2.0, VS 2005, and SQL Server 2005 are all tied together. This means that instead of using T-SQL, one can build stored procedures and triggers in any of the .NET-compatible languages. New personalization features for ASP.NET, such as support for themes, skins, master pages and ?web parts. .NET Micro Framework ? a version of the .NET Framework related to the Smart Personal Objects Technology initiative. .NET Framework 3.0, formerly called WinFX? ?was released on 21 November 2006. It includes a new set of managed code APIs that are an integral part of Windows Vista and Windows Server 2008 operating systems. 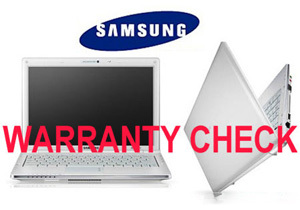 It is also available for Windows XP SP2 and Windows Server 2003 as a download. There are no major architectural changes included with this release; .NET Framework 3.0 uses the Common Language Runtime of .NET Framework 2.0. Unlike the previous major .NET releases there was no .NET Compact Framework release made as a counterpart of this version. 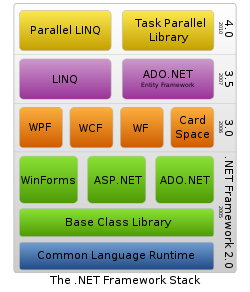 Version 3.0 of the .NET Framework shipped with Windows Vista. It also shipped with Windows Server 2008 as an optional component (disabled by default). Version 3.5 of the .NET Framework was released on 19 November 2007, but it is not included with Windows Server 2008. As with .NET Framework 3.0, version 3.5 uses the CLR of version 2.0. In addition, it installs .NET Framework 2.0 SP1, (installs .NET Framework 2.0 SP2 with 3.5 SP1) and .NET Framework 3.0 SP1 (installs .NET Framework 3.0 SP2 with 3.5 SP1), which adds some methods and properties to the BCL classes in version 2.0 which are required for version 3.5 features such as Language Integrated Query (LINQ). These changes do not affect applications written for version 2.0, however. The .NET Framework 3.5 Service Pack 1 was released on 11 August 2008. This release adds new functionality and provides performance improvements under certain conditions, especially with WPF where 20-45% improvements are expected. Two new data service components have been added, the ADO.NET Entity Framework and ADO.NET Data Services. Two new assemblies for web development, System.Web.Abstraction and System.Web.Routing, have been added; these are used in the ASP.NET MVC Framework and, reportedly, will be utilized in the future release of ASP.NET Forms applications. Service Pack 1 is included with SQL Server 2008 and Visual Studio 2008 Service Pack 1. It also featured a new set of controls called “Visual Basic Power Packs” which brought back Visual Basic controls such as “Line” and “Shape”. Version 3.5 SP1 of the .NET Framework shipped with Windows 7. It also shipped with Windows Server 2008 R2 as an optional component (disabled by default). For the .NET Framework 3.5 SP1 there is also a new variant of the .NET Framework, called the “.NET Framework Client Profile”, which at 28?MB is significantly smaller than the full framework and only installs components that are the most relevant to desktop applications. However, the Client Profile amounts to this size only if using the online installer on Windows XP SP2 when no other .NET Frameworks are installed. When using the off-line installer or any other OS, the download size is still 250?MB. Parallel Extensions to improve support for parallel computing, which target multi-core or distributed systems. To this end, technologies like PLINQ (Parallel LINQ), a parallel implementation of the LINQ engine, and Task Parallel Library, which exposes parallel constructs via method calls. are included.